My pessimistic prediction that Curiosity’s science team would take the least risky route and thus not pass close to the butte with the balanced rock has fortunately turned out to be very wrong! 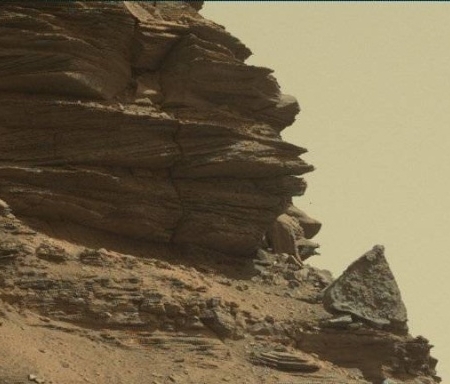 They have moved Curiosity into the closest gap to get the best views of both the balanced rock as well as the butte behind it. 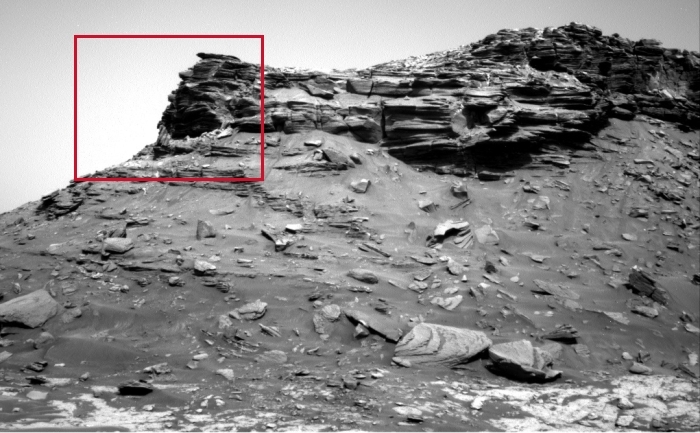 The image on the right, cropped, was taken by the rover’s mast camera as Curiosity entered the gap between the buttes. 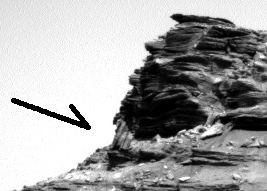 It shows clearly that balanced rock broke off from the layers above and landed on its side. The image below the fold shows the same butte after Curiosity had passed the balanced rock (inside red box). To the right is a close-up showing the area in the red box. You can clearly see the vertical bedding planes on the backside of the rock. In fact, if you look at the entire face of the butte as well as the debris below, you can see that it is heavily layered, and that pieces have been breaking off it repeatedly to roll down the slope. Not surprisingly, the science team has been taking a lot of images of this face and its layers. The weekend plan went well, so the plan for Sol 1432 is to keep driving! Curiosity will go about 52 meters across a patch of sand, but before that we have a short science block. To my delight, they are going to cross the patch of sand that crosses the gap, taking the most direct route into the mesa-filled territory to the south, heading directly towards Mt. Sharp’s upper slopes. Cool that they are going this way! I don’t see how it is evident that the balanced rock could have broken free from the butte above. It is much less red. And equilateral, not layered.